A cool front is in the process of finishing its voyage across the region, bringing an end to yesterday's humidity and storms. After a day with dew points in the 70's and 100 percent sweating on runs and walks through the Delaware Valley, relief is on the way later today. Dewpoints will drop into the 50's on the strength of northwest breezes. 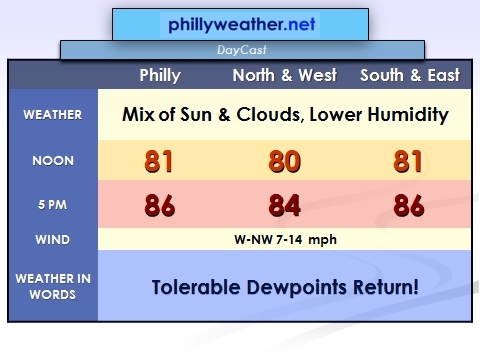 While it will be a seasonably warm day (mid 80's for highs in Philly), having dewpoints eventually some 15 degrees lower will be a lot easier to handle. Skies will for the whole average out to a mix of clouds and sunshine. Also on the docket today is a storm free day for just about everyone -- which will make up for yesterday's thundery regime across the Philadelphia suburbs with the two plus inches of rain that fell in parts of Bucks and Burlington Counties during the morning hours with thunderstorms that caused some flash flooding along I-295. The only exception to the storm chances may be in Southern Delaware as a batch of thunderstorms currently in Southeast Ohio works east-southeast through Maryland. This may clip the lower half of the First State later today if they hold together. The weekend weather regime features pretty typical late August weather -- lower and middle 80's for highs, tolerable humidity both Saturday and Sunday. Today's the reintroduction to it and by evening, you'll notice a much more comfortable regime in place.